(CNN) - Wisconsin voters inundated by advertising and door-to-door canvassing began delivering their judgments Tuesday on whether to recall Gov. Scott Walker, a Republican hero for pushing austerity measures that stripped collective bargaining rights from most public unions. Early exit polling suggests those efforts might have been wasted, as 88% of those responding to poll-takers said they made up their mind on how to vote before the end of April. It's also judgement day for the Obama administration agenda. I know everyone has been beating up on Walker on this site (including me) but could you at least have posted a picture of him that didn't look like the bad end of a three-martini lunch? The cowardly FleaBaggers should be fired based on desertion of duties. I hope the citizens of Wisconsin send a message loud and clear to the corrupt unions that the days of living high off the taxpayers dime is OVER. So union members, how many MILLIONS of your hard earned dues AND tax dollars were wasted in this fiasco??? You can thank your corrupt union bosses and the leftist Democrats for that massive waste of YOUR money. Your family and kids really didn't need the money anyways, right? So it's only judgement day for Walker not Barrett? The media is already setting this up so if Barrett loses its like he was never really part of the equation. 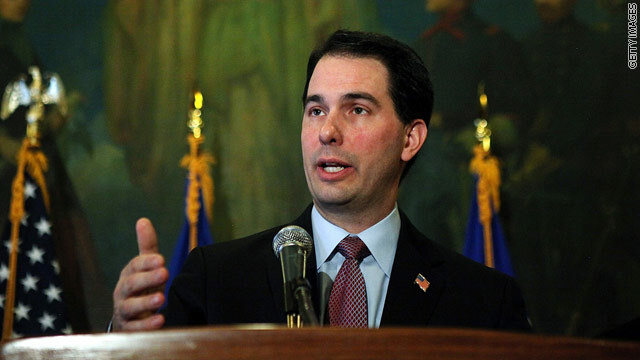 It was all only about Walker and his policies not the policies that Barrett would impliment. The unions have protected the workers in this country for years and the big corporations have NOT like it a bit.They want to lower wages,decide the working conditions,NO breaks,NO sick time,NO time off for pregant women,extend working hours with NO time & 1/2 pay NO double time.Thats just a few not includeing the benefits.Benefits the workers will NEVER see when it comes down to it.Walker should be thrown out on his ear immeadiately.I can't wait. Not to mention the UNIONS. But the union backed candidate didn't even get past the Democrat primary! As usual, the leftists and their lackeys in the LSM spinning another one of their disasters into something else. Yes, it was all WALKER'S fault for doing his job for the taxpayers of Wisconsin and for not buckling to the unions. With a Democrat Congress in control means only one thing if Walker is elected, they have the power to reject him by just voting NO. Yes it is the judgement for Scott Walker not others. The main target is walker. Others can survive or lose, but whatever happens to Walker means a lot and thats what is all about the recall. I hope the people of Wisconsin decide what is best for them. I just don't understand how this is a referendum on anything other than Wisconsin politics. Voting is not a team sport, and politics shouldn't be a sport at all. I just don't get it. Take the money out of elections, let the people decide what is best for them at the local, state, and national levels. If you're not represented, you shouldn't be involved; why is that so hard to understand? Wisconsin residents, I applaud you not only for handling your own house in your own fashion, but for putting up with all the outside influence this has generated. Good luck and God bless us all (we're gonna need it). when the Democrats won that normally Republican seat in upper NY state that was supposed to be a referendum on Republicans, when the Republicans won the normally held Democrat seat in lower NY state that was supposed to be a referendum on Obama and the Democrats.......heck most people in BOTH parties seem to have forgotten about that since neither election changed much of anything. I figure this will be the same way whoever wins they'll beat their chests for a while and claim it's doom for the other party but come November I doubt if many voters outside of Wisconsin will consider it when they pull the lever for POTUS. In NY, everything that Walker claims he was trying to do was accomplished WITHOUT stripping collective bargaining rights. All the GOP wanted to do was to use WI as their own little social engeineering experiment. The GOP could really care less if the economy tanks, since their sole agenda has been to crush the unions and eliminate the rights of anyone to negotiate for wages and benefits-all in the name of liberty and freedom, of course. The idea that a union member is ALSO a taxpayer has never crossed the minds of the righties, only that they are somehow responsible for everything that is wrong in the country. National debt? Blame the unions, not the ridiculous tax policies that ended up cutting revenue without corresponding cuts across the board in areas like defense and corporate welfare. The Right has never accepted the idea that all their goodies cost money too, snce that would force them to admit that virtually every economic idea they have had over the last 40 years was fundamentally flawed from the start. Modern conservatives are, by definition, flawed, since they have such a hodge-podge of worthless ideas culled from second rate minds like Ayn Rand. A CNN contributor said yesterday that recalls should not be allowed. That the people elected into office should serve their complete time. I guess WI thought different. Mitt is the most "DESASTER" to USA. Tell me , what type of Governor needs a legal defense fund if he has not done anything wrong. Just wait until Walkers former aide testify against him in the John Doe investigation. Bye bye walker. does not matter if you win re-election or not. Walker is the hero of the Republican Party and all of America. Keep up the good work Walker, you will survive this injustice. It seems end game for wailker. I can't wait to see his down fall. Probably if he has the opportunity next time, he would follow the voice of the citizens rather than the corporations that are using him for their selfish interest. "WALKER'S fault for doing his job for the taxpayers of Wisconsin"... You mean the billionaire company owner with whom Walker is shown on tape describing his plan to 'divide and conquor' the Unions. Which can only mean one thing... if he succeeds in crushing the public worker's Union, then the firefighters and cops are next. That ONE taxpayer. It sure seems funny (ironic, not haha) that these conservative nutjobs on here keep talking about these HUGE Unions and this out of state money, yet all reports (well, maybe not FAUX reports) have shown that Walker is getting alll the money and most of it is from out of state. Little hard to reconcile your B S when you are shoveling such maasive amounts of it. Democrats still don't understand that the majority of people in Wisconsin prefer Scott Walker over a democrat but they seem to be too ignorant to understand something so simple. How typical of them.